One of the major draws to visiting Europe in winter is the Christmas Markets offered by many European countries. Despite the competition, there is only one country that stands out among the crowd and that is none other than the Christmas Markets in Germany. What makes it so special? Have a read of our top 3 picks and be amazed by the beautiful pics! Christmas starts early in Nuremberg with decorations and beautiful Christmas markets starting to light the town as early as November. The competition is stiff as other towns like Dusseldorf are frantically putting up a good fight by throwing up their best Christmas lights, decorations, and stalls. To much suspense, the Nuremberg Christmas Market pushes on strong as our top pick for being the best German Christmas Market in all of Germany. Historically speaking, Christkindlesmarkt (the Nuremberg Christmas Market) takes place in the medieval city of Nuremberg where astonishing architecture and historical buildings loom over the markets. The sense of being in a Night before Christmas is highlighted in the beautiful city. From as far as 1628, the Nuremberg Christmas Market has been in action with associations to the uplifting vibe of a wonderful and jolly festive season. Nuremberg’s main Christmas Market is held at the largest square, Hauptmarkt, and boasts vibrant colors and sounds backed by stalls selling quality handcrafts and a lot of yummy food. Smells of beautiful German sausages cooked to perfection wander through the air as the clinking of beer glasses and the cheerful laughter of the locals bright up. If beer isn’t taking your fancy, a traditional German eggnog will help warm you up during this cold winter time! Starting a bit earlier than the Nuremberg Christmas Markets, the Dresden Christmas Markets hope to take away some attention before Nuremberg steals it away. It’s all in good fun as traditional fruit cakes (known as Stollen - Streizel) and butter cakes are being sold by the locals. The wonderful local treats that only come out during Christmas are aplenty at stalls dispersed throughout the streets attracting hungry visitors simply by smell. It’s a wonderful time of the year as decorations of lights fly above the heads of awe-inspired visitors and a large Christmas tree rests at the center of the Dresden Christmas Market. Other awesome highlights include the tallest Nutcracker the world has ever seen alongside the tallest Christmas pyramid ever known to man! There are also other attractions such as fairytale houses and a puppet theatre to seal the Christmasy feeling. The Dresden Christmas Market, known locally as Streizelmarkt, is beautiful this time of year as the wooden huts that make up the market are covered in white freshly fallen snow. 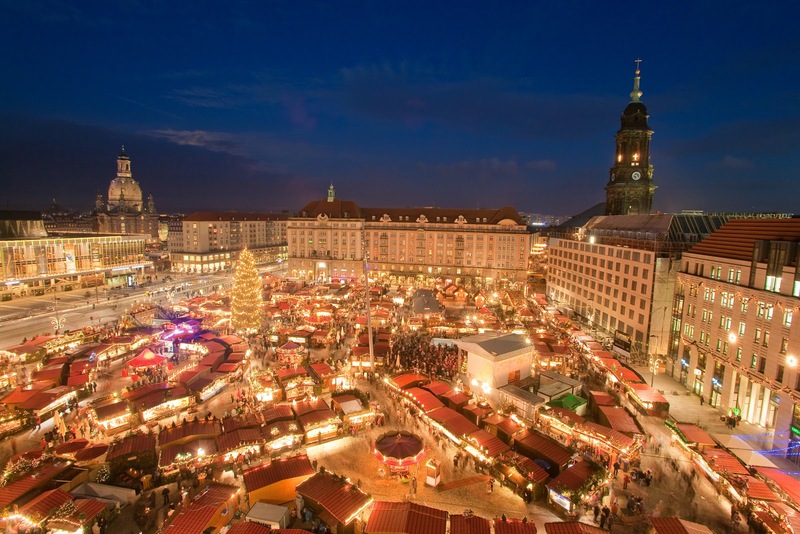 Dating back to 1434, the Dresden Christmas Market is arguably the oldest Christmas Market in all of Germany. If you’d love to see the Dresden Christmas Market from afar, an evening boat trip on the River Elbe will give you some of the best views to take some amazing photos of what the Dresden Christmas Markets has to offer! Our third finalist is the Cologne Christmas Market which stands close to the Cologne Cathedral giving it a magnificent Gothic impression on a beautiful Christmas Market. If ambiance of a is what you are looking for, there’s plenty here at the Cologne Germany Christmas Market! The Christmas Tree is the main attraction here but with an expanse of activities such as ice skating and stalls to keep you entertained, you could easily spend your entire night away wandering around this beautiful place. Thinking it’s time to take a break and explore a whole new scenic beauty of German Christmas Markets? Find out how you can get cheap flights to Nuremberg, Dresden, or Cologne by using FareDepot! In fact, a simple search on Fare Depot’s website will help you find cheap airfare to Germany no matter where your destination is!